The very word "spinning" embodies fun, doesn't it? Add whorl/whirl, and the idea is magnified further. So playing and games, it would seem, are central to spinning. In making yarns off the beaten path, play is a good place to start. New spinners as well as spinners who've refined their skills to make the fine yarns that they require for their particular needs both ask in workshops, "Can I use anything in a yarn?" 1. Release preconceptions about what "yarn" is. 2. Let go of ideas about "use", if only temporarily. 3. Adopt an exploratory mode/attitude. If it's too challenging to do all of the above, try thinking of soup. Soup can be hot, cold, meatless, creamy, thick with veggies - you get the idea. In the kitchen, there are no restrictions. In play, it's more fun when restrictions are loosened. It's easier to let the rules relax a bit when one wants to create something new or unexpected and it's also easier to create freely when one relaxes the rules. Next, you are going in search of ingredients. No toy store, notions counter or grocery aisle is safe. You will look with new eyes upon cones of thrift store thread, spices from the Indian grocery store, most anything with a hole in it (for stringing), and anything that's even vaguely pliable. Search out the exotic, the "unsuitable" and "ruined" fibers at festivals for the purposes of experimentation. You will bring your treasures back to your wheel and spindle and begin to play. What if I made a yarn that is a self - portrait, a yarn that could take over the world, a yarn that was a poem? If you want to try plying with fourteen threads, adding crocheted flowers, felt strips, plastic toys or tomatoes, let no one else tell you that you can't. Be your own guide. This is your own spinning laboratory. If you want to learn the basics of spinning before you delve into the unknown, have patience and search out accurate information. Test it - see if it works for you. 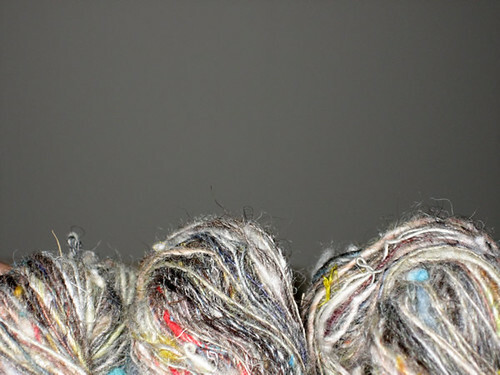 If you prefer to dive in and start experimenting with artistic interpretations of yarn, do that. If you tune into your own intuition and pay attention, you will learn how to create yarns that teach you all that you're trying to learn, including techniques known or perhaps unimagined before you thought of them. Following your sense of curiosity and creative hunches, you will keep your spinning heart (and spinning as an art) alive and you will grace the world with expressions of your time on earth.